Teaching offers the chance to change other people’s lives. As a teacher, you can help to develop somebody’s subject knowledge and maybe even their mind and personality. Teaching is incredibly rewarding, and good teachers are needed everywhere, from schools to universities to businesses. A teacher is a licensed professional educator who is responsible for teaching the school’s curriculum to their students. A teacher walks into their classroom every day with the drive to inspire students to set high expectations for themselves. With hard work and dedication, they can dream big and find their own success. A teacher develops lesson plans to teach students a wide range of subjects that will apply to their future endeavors. Teachers make use of educational tools for demonstration in teaching students for better understanding. 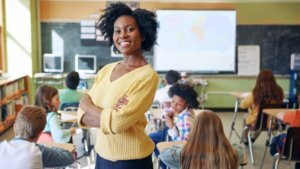 Aspiring teachers may obtain a bachelor’s degree; while in ccollege, prospective teachers simultaneously participate in teacher preparation courses and subject matter courses.